"A petition presented to organize township 133, range 42, to be known by the name of Aurdal, fixed the time and place of holding the first town meeting. The above petition granted, the time of holding the first town meeting shall be on the day of at the house of Jonas Hallan. Done by the order of the board of county commissioners, this 9th day of October, A. D. 1869." Evidently the township was created at the October session, but for some reason not known it was not recorded until the November session. It may also be noted that no definite time was set for the election, a fact which makes it appear that there was no hurry about getting the township organized. In fact, the township was not organized in accordance with the above order of the commissioners, since on January 4, 1870, "a petition was presented to reorganize the township of Aurdal." The petition asked that the first election for township officials be held at the house of Jonas Hallan on the 24th of the same month. 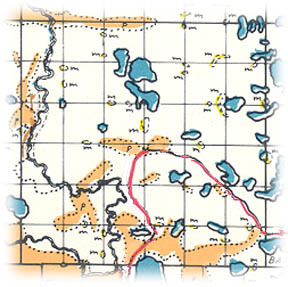 On January 3, 1872, the unorganized lands south of Otter Tail river, in township 134, range 42 (now Friberg township) were added to Aurdal for all township purposes. The petitioners asking for the Organization of Aurdal township were as follows: O. Jorgens, Aslag- Torgusson, T. Torgusson, A. Annersen, Andru Annersen, Venet Halverson, H. O. Kaigen, Gunder Torgusson, Engebret Nelson, Nils Peter, Troud Svenson, Jon Monson, Knut Hendrikson, H. Nelson, N. E. Nelson, John Anderson, E. Anderson, S. Syverson, K. Erikson, C. Erikson, F. Oleson, Jonas Hallan, Ole Hallan and Ole H. Branden. The township is thickly dotted with lakes, the largest being Fish lake, in the northeastern part of the township. Among the larger lakes may be mentioned Brekke, Loon, Little, Nelson, Norway, Wall, Bass, Mid, Spring, Aunel and Egg. The Red river meanders through the western part of the township from the north to the south and affords ample means for natural and artificial drainage. Despite the fact that the township has so many lakes the land is not swampy, but, on the contrary, has much valuable farming territory. The first actual settlers in Aurdal township were Engebret Nelson, wife and four sons; Johannes Anderson, wife and one son, and Ole Erickson, a single man. These people, who were Norwegians, came from the southern part of the state, where they had stopped temporarily after coming from Norway. All but one of the ten were born in Norway. With their arrival in the summer of 1868 the township became known gradually as a Norwegian center, and so fast did the population grow that little more than a year later the township was asking for organization as a civil township. The difficulties which it met in getting established have just been stated, but with its formal organization it entered upon a healthy growth, which has continued down to the present time. The Nelsons settled on section 23 and representatives of the family are still in possession of the tract originally homesteaded. N. E. Nelson kept the first postoffice at his house and he remained the sole representative of the government for many years. N. E. Boen was the second postmaster and he kept it at his house in section 25 until it was permanently established at Wall Lake. The first merchant, Julius Morstad, displayed his notions at Wall Lake, a village on the northern shores of the lake by the same name. At this same place Alfred opened the first blacksmith shop in the township, which was one of the very first to make its appearance in the county. Wall Lake was never platted, the only platted site in the township being Mill Park. It was platted in the fall of 1893 and recorded on December 28th of the same year. It was platted by George A. Burbank for Charles D. Wright and is located in section 31. The township hall is in the extreme northeastern pact of section 21, practically the center of the township. The Northern Pacific railroad runs east and west through the southern portion of the township and since it was built, in 1882, the township has had ready access to the outside world. Wall Lake station is on the railroad due north from the lake of the same name and is the only station stop in the township. The present township officers are as follows: Supervisors, N. M. Nelson, J. E. Boen and O. A. Haave; clerk, Louis Halvorson; treasurer, O. G. Torgerson; justices, G. S. Brekke and Alfred Bergerud; constables, J. B. Johnson and Ole Aas. Places of birth for Aurdal Township in the 1905 state census.